Launched in early 2000, iWindsurf quickly established itself as a cutting edge web application and quickly became an absolute household name in the North American windsurfing industry. In September 2013, iWindsurf received a massive upgrade — taking full advantage of the WeatherFlow Weather Engine and our enhanced weather tools first developed for WindAlert. Classic iWindsurf will remain available for those preferring the traditional look, but the new Global iWindsurf delivers far deeper coverage in terms of weather station reports and forecasts throughout every single country and region of North America, the Caribbean, Europe, Australia & Oceania, South America, Africa, and Asia. iWindsurf is available in several platforms including Web, iPhone / iPad, and Android applications. Each application offers a powerful FREE service level with additional premium content available for minimal membership fees in the Plus and Pro membership levels. 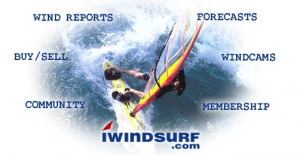 Like iKitesurf, iWindsurf.com is a key example of what WeatherFlow can do to meet the needs of a highly specific target audience. To take a tour or sign up for an account, go to iWindsurf now.